I visited the pages of some friends to get some inspiration for this blog, but find I am still a bit in the dark about what to write. I don’t have to write, but my last blog got some of my faithful prayer warriors a bit worried and I just need to let them know that I’m o.k. I am o.k. I had an extremely grouchy day piled high with the emotions of a holiday without Dan and without the shock that helped to numb everything during the last holiday season. It was a rough day although my mom seems to think I hid it well. But after venting a bit on my blog I was able to sleep and woke quite refreshed and cheerful. I got a little quieter when we pulled out the Christmas decorations and lights and put up a tree for the kids (they decorated and I’m trying hard to let it alone . . . =). But then Sunday night we turned all the lights off, turned the Christmas lights on, turned the music up, and bounced and danced around all over the playroom and made quite the ruckus (not to mention quite the mess). In the midst of all the fun a song came on that said “I could have missed the pain, but I would have missed the dance.” And I found myself strangely grateful for my situation. I could have missed the pain of losing Dan, but then I would have missed the joy of knowing Dan, not to mention the joy of ALL SEVEN of my children. I hope that somehow I can convey to them their importance in the grand scheme of things. It hurts, but I have no regrets. It’s midnight again and I am waging a war. Rage and frustration, grouchiness and loneliness, depression and grief are all roiling around, bubbling over, and spitting out a sticky black goo that melts into and absorbs everything it touches. Some would say that I am an innocent. How can I not be with my simplistic view that I can be happy and trust my God to handle and direct my life in a loving manner? I object. I don’t have to be exposed to all the dirty little secrets this world holds to know that the life we are living is less than perfect. I am being faced with it again and again, day after day, as I try to come to grips with the fact that my “perfect” life has been shattered by the filthiness of sin and corruption. I had a taste of what God intended in the Garden of Eden and like Adam and Eve I feel as if I have been thrust out of a place of beauty where everything makes sense, into a dreary world of loneliness and confusion. I went to bed at 10 pm. Turned the lights out and everything. And here I sit (12 am), playing with my computer. I just can’t seem to sleep — my brain is whirling. A multitude of strange little thoughts keep popping into my head. I twist and turn and finally give up. I haven’t been keeping up with my internet contacts . . . maybe I’ll check them out. I do have work I could be doing . . at midnight?!! The holidays are looming. I don’t know if that has anything to do with it or not. I’ve had two weekends in a row without kids and I told my boys they aren’t allowed to do that again for at least a month. I managed just fine while they were gone, but I’m not sure I would be able to handle that again any time soon without succumbing to the depression that keeps knocking at my door. Faced down another tough situation the other day. Dan would have been proud of me. He liked to prod me out of my comfort zone and push me to accomplish more. Well, I’ve definitely been out of my comfort zone, but I miss the loving support (from Dan — I seem to be getting lots of it from friends and family, Thank you Very Much!) that was always there to catch me if I ever needed it. Going to try to make some Christmas cookies with the kids tomorrow. I was trying to get some extra sleep to help prepare myself for the ordeal (pleasant ordeal, but still draining). I think I’ll go try again. Benjamin(7) lost his first tooth this morning and I told him that he needed to put it under his pillow for the tooth fairy. He just gives me that look that says “Yeah right, Mom.” I just smiled. We’ve kind of been playing it up all day and tonight I overheard him say to his brother, “If the tooth fairy doesn’t come I won’t be surprised, but if the tooth fairy does come I will be confused.” And then followed a strange conversation about things like magic and dragons, swords and dinosaurs, and other things little boys like to imagine. Just seeing the direction their thoughts went makes me wary about leading them on. Not only that, but I don’t like to promote confusion. God is not the author of confusion. So my fun at playing tooth fairy (what girl wouldn’t like to be a cute little light-weight fairy like Tinker Bell?) will probably be short lived. I was reading Oswald Chambers this morning and he said something that just really got my brain moving. He said that God doesn’t send us into battle FOR Him, but rather He uses us in battle. We are the weapon in His hands. We are so pressured to “Get out their and Serve the Lord!”, “Find the Lord’s Will for your Life”, etc, etc. But all that is demanding that WE do something. God just wants us to be willing and available. The soldier on the battlefield doesn’t want his weapon to try to do things for him, he just wants it to be there, sharp, and ready for his use. And God can use any weapon (or any person). The general of an army doesn’t want his soldiers trying to think for themselves (they don’t know all the details), he just wants them to obey, be where he tells them to be, and be ready to jump when He says jump. So once again, I am reminded that I don’t need to Go Out And Do Something For God, God will (and did) bring my task right to me. Did you know that inanimate objects can speak? I had a conversation with my conditioner bottle the other day. Ha! You think I’m crazy! =) You might be right. Anyway, let me share it with you, modified slightly to make it more enjoyable to read. I was cleaning up and “grieving” (or so I told myself), when out of the blue, my conditioner bottle jumps at me from behind and gives me a good thwack, not to mention a good scare. I mean wouldn’t you be scared if things you thought were inanimate, starting jumping at you!? Conditioner: Just what is God trying to say here?! Me: You’re asking me? You’re a bottle of soap! Don’t tell me you question what God’s will is for your life?! Let me alone. I’m grieving here. Conditioner: Yeah, right. How about having yourself a big ole’ pity party. Me: Hey! I have a reason to feel sorry for myself. Conditioner: So? How many friends do people have who feel sorry for themselves? Do you want to be in the friendless category? They can only handle it for so long and what about the kids? Me: (Grumble, grumble) Why does it always come back to the kids? Conditioner: Maybe because that is where YOU feel like YOU are slacking? Me: Does that mean that I’m nagging at myself? Oh, never mind. I’m going to bed. Conditioner: That would be a good place to start. I know how much sleep you’ve been getting and it’s not near enough. Me: How would you know how much. . . . ? You know, never mind. I can’t believe I’m having this conversation in the first place. Reminds me of Baalam’s donkey, and I’m starting to feel like a donkey. I’m waiting on a group photo from someone else’s camera so this will have to do for now. We were quite blessed to have been given a huge table and it got put to good use this week. 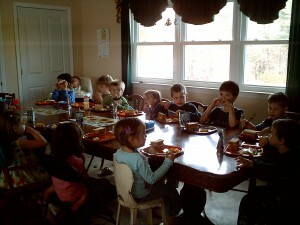 With fourteen kids around it and two high chairs my diningroom was actually quite crowded. I don’t think the adults bothered to sit down much for meal times. It just wasn’t worth it. Our quiver is full to overflowing. =) Still room for more! is often the one who can heal it, too. You and your best friend (the one you would trust with your life) are hanging out. A climax has been reached and your friend must make a decision. He says “Trust me”, and then proceeds to take the route that hurts you the most. You look at him slack-jawed, shocked that he would betray you so. Even though there are others around, the pain of the moment is so intense that you can feel the tears sliding down your cheeks. You trusted him, . . and now he does this?! You cry for understanding, but he just shakes his head sadly and continues on his chosen path. The anger bubbles and you shout at him to come back and explain himself, he doesn’t respond, and then fear overrides and you crumple to the ground, the pain overwhelming your senses. You shut some doors, creating a place to hide where you can go over the options. Maybe if I had done . . . Maybe I wasn’t good enough in this area . . . Was I too . . .? The “what if’s” are too devastating and you shove them all away. Your friend knocks at those doors and wants to hang out like normal. “Why haven’t you called?” he says. Want to come to my house? As humans we have been programmed to protect ourselves instinctively; something is thrown our way and we dodge, dirt gets in our eye and we blink, we get too close to the fire and we flinch. We get hurt and instinct says let’s not do that again. God made us that way, and yet He demands that we overcome that instinct. A sibling says nasty things and we must forgive. A spouse betrays the marriage vows and we must remain faithful. God inflicts pain and we must thank Him for His love. I don’t want to talk to God right at the moment. He nods, knowing the pain I feel and just sits down next to me to wait. He is patient. I’ve been given a gift, or at least I think it’s a gift. Like most things in this world I think it has it’s good side and it’s bad side. I think I’ve been given the gift of looking forward. It pulls me through the rough days, gives me excitement during the lighter days, and keeps me from focusing on possible regrets and “what if’s”. Just what am I blabbering about, huh? I looked out the window this morning and saw our little memorial garden where we placed Dan’s ashes and I paused for a bit of reflection. Before I knew it, my mind was wandering to the bulbs I didn’t get planted yet, the load of mulch I still wanted to put on it, the expansion I want to do next year, etc. I realized that this kind of thought process has become something of a pattern. Sometimes I have to force myself to continue reflecting on the things in the past so that I can allow the emotions to break free. Maybe it’s part of a habit I picked up in the teen years that helped me get myself motivated in the mornings . . . whatever the case may be, it has helped me to face my future one day at a time. I feel the sorrow and regret building and what I really want to do is go back to bed and stay there for a day or two, but duty calls and it’s not going to go away. I think of Jonah. He was called to Ninevah. He put it off. His responsibility was still there when he got back from his vacation in the big fish, the only difference now was that he now had this huge task to do while smelling like the inside of a stinky fish. Somtimes my days are like that. I put off getting out of bed as long as possible and then when I do, my presence is required immediately downstairs and I have to get through my day (without my shower=) and it starts off on the wrong foot (like with cereal spread all over the kitchen floor, milk mixed in and trampled everywhere, and kids demanding instant attention as they are “starving!”). I suppose some would fear that I’m not getting enough time to grieve properly because of the constant demands on my time, but those demands are also helping to keep me from sinking too far into depression. And I’m still working on the grieving thing. As long as I don’t bury it, cover it up, and refuse to face it I think I’m headed in the right direction.